By Larry Cebula with research support from This story brought to you by the Northwest History blog. This dashing young man who perches in front of the Spokane Club, leaning on his sword and staring down the traffic on Monroe with steely-eyed determination is John R. Monaghan, who died because of a book. In 1890, Alfred Thayer Mahan published his magnum opus, The Influence of Seapower Upon History. Thayer was a geopolitical strategist and an admiral in the United States navy, and he argued that throughout history great empires had flourished not by controlling large land areas, but by ruling the seas. America, Mahan wrote, should build up its fleet and seize islands that could function as naval coaling stations around the world. The book had a huge influence on policymakers in Washington D.C. and the world over--which would eventually prove fatal to a jug-eared Spokane teen named John R. Monaghan. Monaghan's father James was an early settler of the region who made a fortune in mining and railroads. He sent his son to Gonzaga College, where John was in the first graduating class of 18 students. 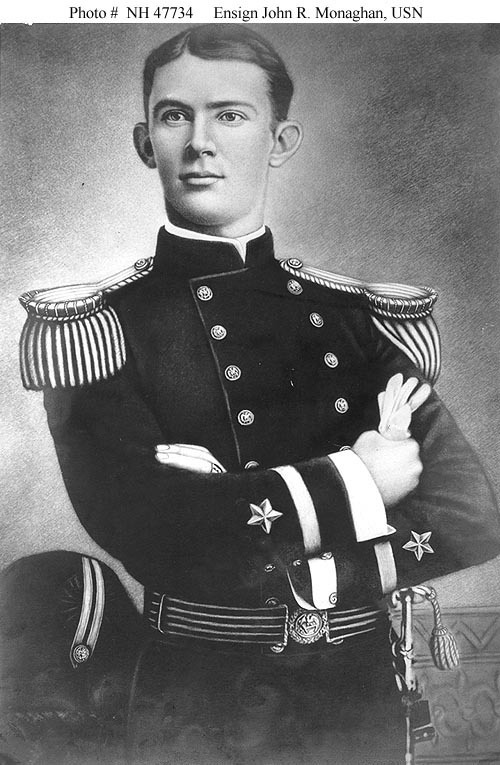 As ambitious as he was privileged, young Johnny went east to the Naval Academy, the first person from Washington State to attend that institution. Fueled by the admiral's writings, the great age of American Imperialism was underway, and Monaghan was its eager instrument. The U.S. Navy of the 1890s was the cutting edge of empire. Aboard the battleship Olympia, Monaghan saw service across the wide Pacific. He took part in naval shows of force in China and Japan. He participated in the ceremonies marking the forced annexation of Hawaii into the American domain in 1898. He helped intimidate Nicaragua, where America was considering building a canal to link the seas. It was heady work for a young naval officer from Spokane. On October 26, 1906 the Ensign John R. Monaghan Memorial was dedicated in Spokane with suitable pomp and circumstance. Five thousand Spokanites turned out for what the Spokesman-Review described as "eloquent addresses" and a "magnificent parade" a mile in length, that included every active military man, veteran, and marching band the city had to offer. Young Ensign Monaghan. His career in the U.S. Navy was to be eventful, but brief. ~ Source: Courtesy of the Wikimedia Foundation. 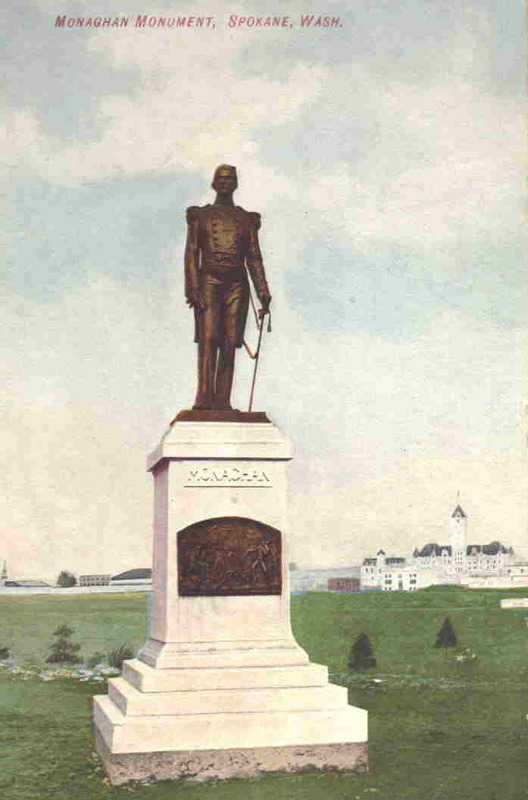 Old postcard of Monaghan Statue. ~ Source: Wikimedia foundation. 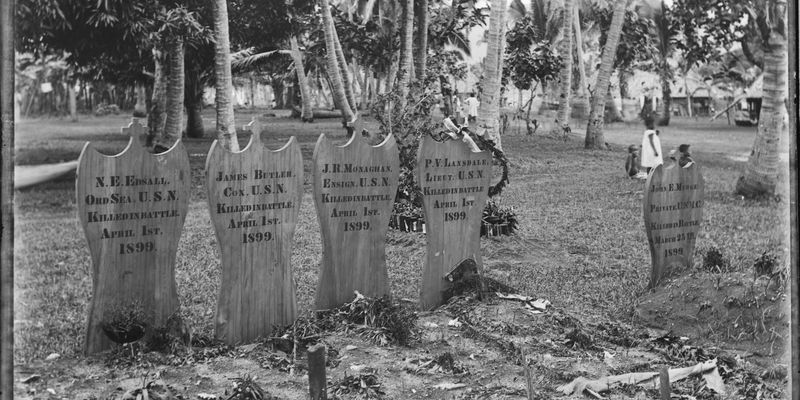 Monaghan's Grave in Samoa, 1900: This photograph, taken in 1900, shows the graves of Monaghan and the men killed along with him. Public property, watch for traffic. 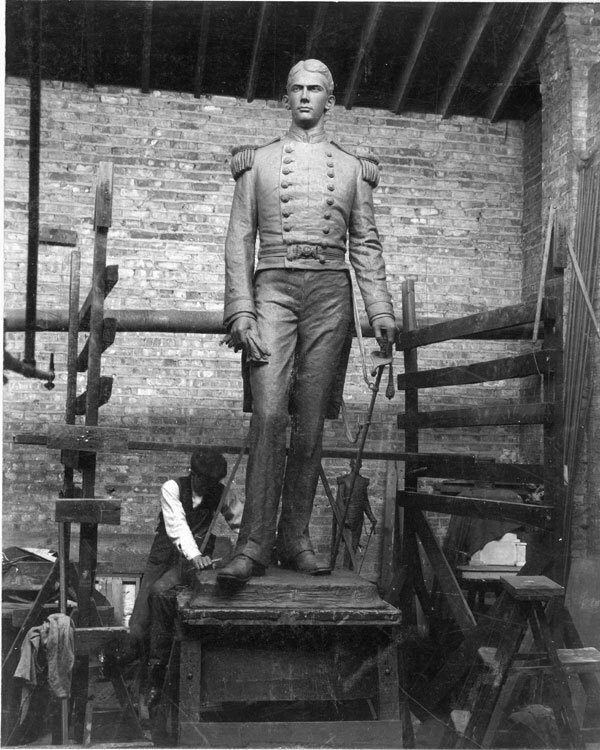 On the anniversary of Monaghan's death, your can hear ghostly moaning that sounds like it is coming from inside the statue. 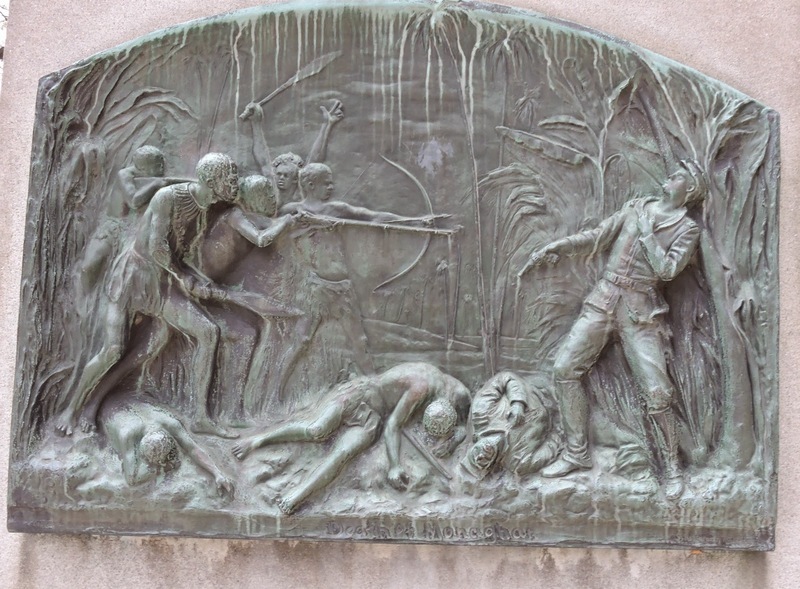 Larry Cebula, “John R. Monaghan Statue: Martyr to An Obscure War,” Spokane Historical, accessed April 20, 2019, https://spokanehistorical.org/items/show/600.